Early Monday Morning | Kappa Kappa Kappa, Inc.
“Early Monday Morning” by C. Curry Bohn was the tenth painting chosen for restoration. This painting, measuring 26”x30” was purchased in 1934 for $250 and its current value is $15,000. It depicts an autumn landscape with cottages flanking a stream and a woman washing clothes in a large pail outside a cottage. C. Curry Bohn was born in Nashville, Tennessee, October 19, 1894. His father was an artist doing much of the decorative work for the Mardi Gras in New Orleans in his late life. As a youth, Curry Bohn spent his days in school and learning the trade of printing in Louisville, Kentucky. As a young man, while serving as a foreman in a large printing firm in Chicago. Mr. Bohn spent his spare time as a student and artist and was even then winning awards for his artistic efforts. He was a member of the Pallet and Chisel Club and the Chicago Photo Society. His many interests included painting in oil, water color, monaprints, etching, and photography. He studied at the National Academy and Art Institute of Chicago and received his greatest inspiration from Edward F. Timmons, a painter of landscapes. 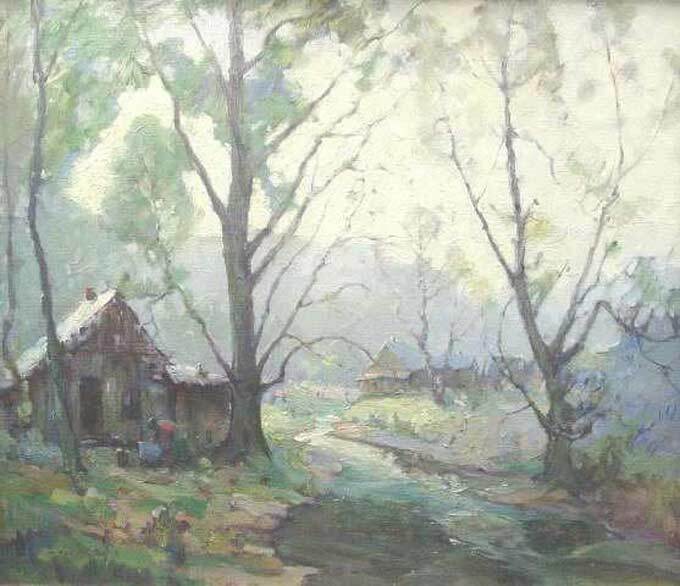 About 1921 he made his first trip to Brown County on a vacation and found there the variety for his many expressions of art. In 1932 he purchased an old farm about two miles north of Nashville in Brown County making this his unusual studio-home.